Many Mormons insist that the sticks mentioned in the foregoing verses actually speak of books. One of the books, they insist, is the Bible, while the other is the Book of Mormon. The Hebrew word used by Ezekiel is ets, which means “wood, tree, stick”; translated in this passage as stick, ets is also used in Numbers 15:32; 1 Kings 17:10; 2 Kings 6:6, and Lamentations 4:8, to name a few places. Had God meant “scroll” or “book” here in Ezekiel He would have used the word cepher, which appears in Joshua 1:8; Isaiah 30:8; Jeremiah 36:2; Daniel 12:1, and Malachi 3:16 to cite a few examples. And Ezekiel himself uses this very word in chapter 2, verse 9 of his book, so obviouly we know he was aware of it and therefore could have used it here in chapter 37; if God had wanted him to. It needs to be understood here that these Hebrew words are not used interchangeably in Scripture. In hermeneutics—the science of biblical interpretation—it is always proper to understand a passage of Scripture in its full context, and to interpret it in the plainest sense. In other words, using the historical-grammatical method we need to attempt to see how the people who received the original document in the historical setting would have understood it. The context of a passage, and the definitions of words must be as they were at the time the text was written for it to be understood correctly. People need to be careful not to “interpret” the Bible in an attempt to make it say what they want it to say so as to advance their own teachings. To correctly approach this passage from Ezekiel one must remember, that just as the English language has different words for a book or a stick, so also does the Hebrew. And this would be true for most known languages as well. Did Elisha cut down a book or a scroll and then throw it into the water? The obvious answer to both of these questions is no. So then, it would only make sense to understand this passage of Scripture in Ezekiel 37 to simply mean sticks as well, because this same Hebrew word ets is used in each case. The logical conclusion is that Ezekiel 37:15-17 is to be understood literally. The Lord told Ezekiel to take one stick and carve on it, “For Judah”, etc. Then to take another stick and carve into it, “For Joseph”, etc. This was all Ezeliel was to write on these sticks and then join them together; it’s not at all referring in any way to The Book of Mormon. Now God may have done a miracle and supernaturally joined the sticks as one, or Ezekiel may have simply held them together in his hand. 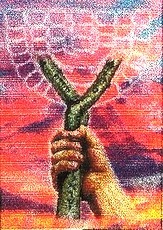 The two sticks were to be used as a visual aid for the people Ezekiel would later be addressing. This portion of the Bible is about the Lord declaring that Judah and Israel, the two houses of His people divided since the reign of King Rehoboam, would be brought together as one nation with one king again. The literal historical context of this Scripture becomes clear by reading through to verse 22, as this whole chapter is dealing with the restoration of Israel to her own land. For these reasons, the Christian Church—along with orthodox Judaism—because of the actual historical evidence, has long considered that this passage of Ezekiel, is literally referring to sticks of wood. Following the incontrovertible laws of linguistics, combined with all this historical evidence, the case is much too strong for the assertions of the Mormon Church to stand. Of course, the widow of Zarephath was not gathering books, any more than Elisha cut down a book from a tree. Neither was Ezekiel holding books (or scrolls) in his hand as Mormons all too often imply. And in the end, the reason that the historic, orthodox, Christian Church has always rejected the LDS view that this passage of Holy Scripture foretells the coming of The Book Of Mormon is that it feels a proper hermeneutic compels the reader to understand these words of Ezekiel literally.